Seamlessly blending style and utility, this wine bottle and glass rack is an excellent option to stack your prized wine bottles. Constructed with high quality metal this wine rack holds up to 15 wine bottles and features convenient glass storage and a sleek black surface area that can be used as additional serving space for your guests. A must have in any dining room or kitchen, the elegant curved design draws the eye and blends well with any decor all while keeping your wine collection safe. Bamboo Wine Rack Espresso Acc. Bamboo Wine Rack Espresso Acc. 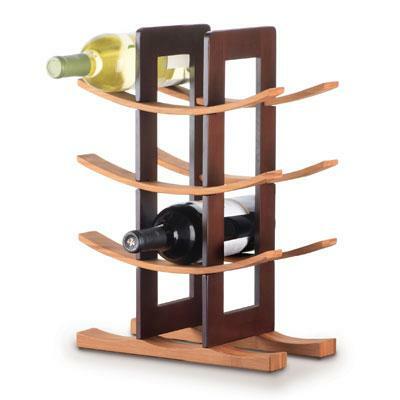 Anchor Hocking Bamboo Wine Rack with Espresso Accents Gift Boxed. Stylish wine rack with modern Asian aesthetic holds 12 bottles 3 curved shelves and base in natural bamboo; supports with espresso finish Easy to assemble. This item cannot be shipped to APO/FPO addresses. Please accept our apologies.